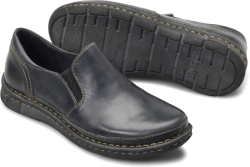 Our best-selling slip-on leather moccasin, crafted with hidden stretch tabs for easy on and off and an ultra-flexible outsole. Yes. I bought these in Biscotto. Within a day of wearing them they were broken in. (At the split they were a tiny bit snug.) They are perfect for running around town, going to dinner, dressed up, or more casually. I am normally a 10W, but with Børn, size 11M fits me perfectly and consistently. I am going to pack them for my upcoming trip to China. Yes. I've gotten 2 pair of these. They are amazing shoes. I'm about to go in again. Yes. I wish a narrower size were available. I normally wear a 7.5 in narrow. I can get by with a 6.5 to compensate for the width problem when buying Born shoes. They don’t quite fit right, but I love Born shoes. Yes. These are the nicest flats I’ve ever worn. Every time I put them on it feels like I’m wearing slippers. Soft inside and soft leather are both easy to clean. I want the red ones next but they are a little pricey. Yes. These are comfortable as are all Born beautifully made leather shoes. However, they are very wide for a medium width and have a gap on both sides. They have to be worn with socks. I don't understand how they can be perfect for all the other people reviewing these shoes. They are comfortable once you find the right size sock to wear inside them so they don't fall off. This color is closer to pink, and don't really go with many colors. I suppose the color is the reason for the lower price. I am going to try the Penny Loafers to see if they fit closer to size. Yes. I have purchased 3 pairs of these shoes and love them The leather is very soft, so they probably wear out a little quicker than firmer leathers, but so worth it. Every time I wear these I get compliments on them and am asked about the brand. Yes. I have very sensitive feet, with bunions..These are very comfortable, no breaking in needed. I’m in love with these shoes. Yes. I absolutely love these shoes. Great fit, looks good with pants/dresses. Can wear them all day. Yes. My favorite shoes. Please BORN make navy suede. And sell the Mocha that Dillards sells. Yes. I bought these shoes to wear on a trip to Italy. They are so comfortable and required no break in period. They looked great with everything and worked well on the cobblestone streets. I always have trouble with flats gaping on the side since my foot is a tad narrow for regular but not narrow enough for A as. These were perfect. This show is fantastic. Yes. I love these shoes but do wish that they came in 5.5. They are just a little long loose in the heel and the arch support doesn't hit exactly right. That's why I feel a half size smaller would be perfect. Otherwise so cute comfortable and fashionable. I will make them work. Yes. These shoes are so comfortable I smile every time I put them on. Yes. Love my new Born shoes. They are so comfortable. True to size. Yes. The Sebra is my go-to shoe for everyday use. I purchased a pair about 6 months ago and have used the shoes almost daily with excellent comfort and quality. They have received multiple compliments. Yes. This is my second pair in this style. They are so comfortable and the leather is so soft. I feel as if I am wearing slippers. Love these shoes. Keep offering them in different color options please. Yes. Born shoes are always perfect...everyone should buy a pair. You won't stop at just one pair. Yes. Love the shoe love the fit. No where does it say that bosco is green. I wanted brown. Had to return them. Yes. My third pair. Watched for this color for a long time and was not disappointed. These shoes fit my lifestyle perfectly. Yes. I have several foot issues. These shoes were perfectly comfortable right out of the box. The simplicity of the style makes the classic. Plan to buy a second pair. Yes. The heel came up too high so I had to put a heel pad in them. I have been wearing them daily since I got them. I would have preferred leather but settled for suede as leather was not available in my size. Yes. Very comfortable. Feels like a moccasin. Yes. They're very comfortable no breaking in discomfort. They're lovely well-made and exactly what I was looking for. Yes. I love these shoes They were so comfortable and stylish that I ordered another pair in black the same day I received them. Yes. Love these flats. Look expensive and great for everyday comfort wear. Stretch out a little so re-ordered a size down. I first ordered my size and now they're too big. Yes. these are very comfortable and really look great with jeans or slacks during the fall and early winter months. 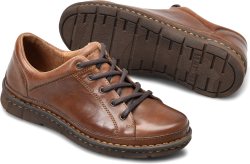 they are a high quality and soft leather and the color i bought is the biscotto color. Yes. Love the shoe and love the look of the shoe. Yes. Love them. Very soft very comfortable great shoe. Yes. Bought a pair for work very comfortable Definitely an all day shoe I'm a size 8 and have a bit wider foot fit perfectly. Yes. 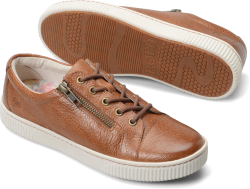 These shoes are wonderful they are true to size comfortable and the odor goes with everything. Yes. The shoe itself is a very comfortable shoe but after wearing it one day I noticed that there is a bad seam at my ankle. It poked my ankle bone and comparing it to the other shoe you could tell the seam was crooked. I contacted BORN and was told that since I wore them once I could not return them. Frustrating Since them were for winter I just have to make sure I always wear socks with them. Great shoe medicore customer service. The shoes are comfortable I will be trying another pair. Yes. Love these shoes They are so comfortable and stylish in their simplicity. Best so ever. Yes. This is THE MOST comfortable shoe you will EVER put on besides your house shoes It feels like I am working in my slippers each day that I have them on at work. NO KIDDING They are super soft and very true to size. I wear a 7 medium and they are straight up a 7 medium and I could wear right out of the box. I am thinking of getting another pair they are so great. Yes. By far the most comfortable shoes I have ever had. I can wear for 8 hours straight easily with comfort. Yes. shoes look like nice professional business shoes but feel like slippers. The overall fit is good. They're very nicely made. Yes. I LOVE my shoes I also bought a pair in black after I tried this first pair. My right foot is a little wider than my left but both shoes worked perfectly on my feet. I will definitely recommend Born shoes to my friends. Yes. I Love these shoes. I bought 2 pairs the black and tan and they are very comfortable. They look good with everything and are easy to pack for travel. Yes. These shoes are awesome. They are stylish and really really comfortable. They do run a half size too small. I usually wear a size 8 1/2 and I had to return those and get a size 9 which fit perfectly. The leather is really soft. I love these shoes. Yes. These shoes are soooo comfortable. No breaking in period at all. Look great with jeans. Yes. Love my new Born Sebre. The fit is perfect. Wore them for 10 hours and no blisters Looking forward to buying the biscotti color as soon as it becomes available. Yes. Great fit stylish and super comfy. Yes. I have finally found the brand of shoes that fit my feet I wear flats exclusively and these are very comfortable. Yes. Great fit and very very comfortable. Yes. Ordered another pair as these shoes are perfect for walking around town and for standing in classroom The most comfortable and supportive flat i've worn in years. Yes. Super cute and comfortable at first, but the more walking I do, the back of the shoes really cut into my leg just above my heel. Perhaps the cut in the back could be lower or more rounded to prevent this from happening.